It’s apparently over a year since my last royal flush. I broke that dry spell last night. Royals are always pretty, but even more so when you get there against an otherwise identical hand. We both flopped a broadway straight and we capped the flop. He led the turn and just called my raise, and I was delighted that he decided to pay off my river bet after I made The Best Hand In Poker with four to a flush on board. It’s not quite as long since I last had quads, but they have never looked prettier than when I managed to hit that last remaining card in the deck to win a massive pot. $56 is massive for $1/$2. 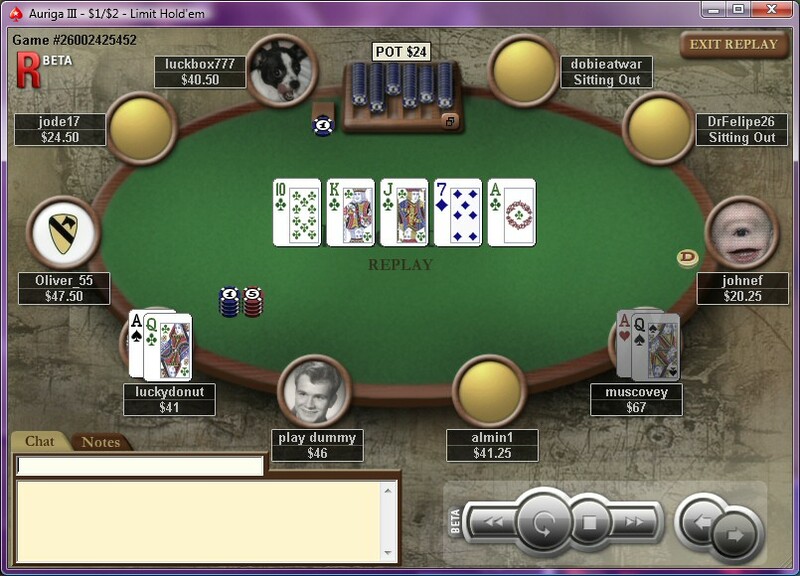 He’d raised pre-flop and I called from the small blind with a couple of other players involved. I put in 4 small bets on the flop when I was behind, then won 4 big bets on the turn and 4 more on the river after I sucked out. It’s the first time for literaly years that I can remember hating the four-bet cap in online poker. Even with a possible flush out there, I’m sure this one was going to the felt if only they’d have let us!